Does the art of Dan Graham and his disciples promise deceptive simplicity or formulaic thinking? Over the past several years, the Whitney Museum has organized with the Museum of Contemporary Art, Los Angeles, a sequence of important retrospectives of artists who emerged in New York City in the mid- to late ’60s, just after the Minimalists. Robert Smithson was the subject of the first exhibition, in 2005; then Gordon Matta-Clark and Lawrence Weiner had shows in 2007. Each was in its own way a triumph. Arguably, this generation of artists born around 1940 (and of course they flourished not only in New York) represents at once the culmination and the exhaustion of a certain Modernist project as it had played out over the preceding century. In their work, formal reflexivity and self-critique reached degree zero; in an ultimate turn of the screw of abstraction, the art object dissolved into language and action. Now it’s the turn of another of their cohort, Dan Graham. The choice must have seemed a no-brainer. After all, Graham is something of a cult figure, especially among younger artists, perhaps because he has dabbled in many of the major artistic issues of the time, above all the relation of the artwork to its social context. And he seems to have garnered an ineffable aura of cool, in part because of his association with rock music–writing and making videos about it but also palling around with musicians (the Whitney catalog includes an interview with Graham by Kim Gordon, the Sonic Youth bassist who is widely recognized as one of the coolest people in the universe). Graham is, as the exhibition’s co-curator Bennett Simpson writes (in an essay focusing precisely on Graham and music), something of an artist’s artist. So I can’t help but feel that I’m about to blackball myself from some invisible club when I say that, in contrast to the three shows I mentioned before, each of which I walked out of having discovered an even richer and deeper oeuvre than the one I already admired, “Dan Graham: Beyond” left me disillusioned. (Curated by Simpson and Chrissie Iles, the show is on view at the Whitney through October 11, after which it travels to the Walker Art Center in Minneapolis, October 31-January 31.) Graham’s work turns out to be mostly a period piece–the product of a brilliant dilettante who was, at least for a while, so in step with the zeitgeist that he sometimes appeared to be a stride or two ahead of it, an illusion that lent his work the appearance of an originality or strength it lacked. If you read the interviews with Graham in the exhibition catalog, it’s fascinating how often he still speaks not on behalf of himself but of the group to which he felt he belonged, articulating a shared sensibility expressed as a series of likes and dislikes. “We hated Duchamp.” “We loved Speer at that time”–referring to the Nazi architect. “We were all very influenced by Jean-Luc Godard.” “We were very influenced by the French new novel, and the idea was not to use metaphor.” Much of the exhibition feels like an anthology of illustrations of what a certain “we” found interesting in the late ’60s. Graham started out not as an artist but as a 22-year-old wunderkind gallery owner. He sold nothing, but in less than a year in business on East Sixty-fourth Street he managed to latch on to some of the best new work of the moment by the likes of Sol LeWitt, Dan Flavin and Donald Judd. The downside of his curatorial flair may be reflected in the fact that every issue he took up as an artist was developed more lucidly and with greater intensity by one or another of his contemporaries. His earliest efforts, formally self-reflexive work with language verging on concrete poetry, are all too successfully featureless and nondescript–arid and dutiful compared with text pieces by artists such as Carl Andre and Vito Acconci. His use of magazine pages as a medium–the great calling card for his first phase as an artist, thanks to the fame of his 1966-67 work Homes for America–is neither as coherent nor as surprising as that of Mel Bochner or Robert Smithson, whose collaboration The Domain of the Great Bear, which inaugurated this genre, was published shortly before Homes for America. And for that matter, his fascination with suburban American housing, not only in Homes for America but in a work like Alteration to a Suburban House (1978/92), seems halfhearted when compared with Matta-Clark’s furious engagement. Graham’s use of performance as recorded, at first on film, then on video, to examine embodied phenomenology recalls a host of artists at the time, among them Acconci, Joan Jonas and Bruce Nauman. Starting at the end of the ’70s, and increasingly in the following decade, Graham’s interest in the feedback between body and environment, behavior and context, led to a form of art that seems halfway between sculpture and architecture–“pavilions,” as he calls them, metal constructions with walls of glass and in particular of two-way mirror glass. “It’s about spectators observing themselves as they’re observed by other people,” Graham says. The notion is seductive, but in practice nothing much ever seems to come of it in his observation pavilions. People catch the idea of it and just move on. Graham’s switch into architecture or something resembling it recalls, again, the trajectory of Vito Acconci–but Acconci’s endeavors in this field have been far more playful, various and challenging. From the beginning, Graham’s core concept has been that the artist’s task is to construct not a singularity but an empty structure–or “schema,” as he calls it–that can be indifferently filled by whatever content. In its first instance, this took the form of a procedure for describing “a set of pages” of any kind whatsoever–generating a text with no other discernible content than “(Number of) adjectives,” “(Number of) adverbs,” “(Percentage of) area not occupied by type,” “(Percentage of) area occupied by type” and so on alphabetically through “(Number of) words capitalized,” “(Number of) words italicized,” “(Number of) words not capitalized” and “(Number of) words not italicized.” It’s a kind of hyper-formalism–semiotic analysis as a Martian might perform it. If you believe that reading need not be pleasurable or enlightening, this text’s for you. What was brilliant about Homes for America was that Graham had found a schema that repeated itself at various levels, but with specific content as a structural linchpin. 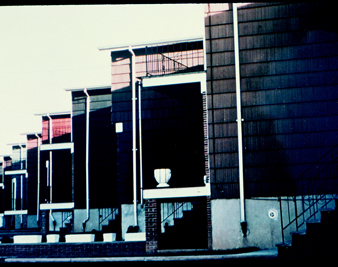 His photos of boxy tract houses in serried ranks, “designed,” in the artist’s word, “to fill in ‘dead’ land areas” with “no organic unity connecting the land site and the home,” since they were simply “separate parts in a larger, predetermined, synthetic order,” were echoed by the boxy, mechanical style of his layout–“insistently squared away,” as Carter Ratcliff once described it–and then by the blank, listlike structure of the texts. These, in turn, echoed both the rectangular schemata of the underlying page design (which most designers try to overlay with something more organic and fluid rather than to emphasize) and the blunt, uningratiating aesthetic of minimalist structure. Here, Graham’s schematic approach operates at a multitude of levels rather than reducing everything to zero. Graham’s performance-based work is a set of schemata too. The works have no predetermined content. They are open-ended structures meant to set up feedback loops between different people’s behavior. Thus, as Graham says, in Past Future Split Attention (1972), “one person is describing the past of another person and that person is simultaneously talking about the future of the other person who’s describing them.” Watching the video record of one of these performances can be fascinating or boring or anything in between–it depends not so much on Graham’s concept but on how “on” the particular performers happen to be in the moment. Graham’s schemata in such pieces are rather like the improv exercises actors use to loosen up their approach to character; the interest of the result depends more on the actors than on the designer of the exercise. Or to put it a different way: such works seem designed to elicit unforeseen psychological or proprioceptive material from their performers–yet Graham never shows any particular interest in working with the material that arises, developing it from one piece to the next. It’s there simply to “fill in ‘dead’ areas” in his schema. Graham’s pavilions can be seen as a form of display architecture in which the audience itself is what’s put on display. He is attempting to get the public to do what, earlier, he had depended on performers (among them, sometimes, himself) to do. “I thought the people themselves, the spectators, should be inside a showcase situation looking at themselves perceiving each other”–that was the thought behind Public Space/Two Audiences, which Graham presented at the 1976 Venice Biennale. It is simply a room divided in half by glass so that the people in each side function as moving images of each other. With the pavilions he developed this thought in free-standing constructions rather than adaptations of existing rooms–but likewise using the interplay of opacity, reflection and transparency to turn people into dreamlike apparitions for one another. By now, Graham has made more than fifty pavilions, some of them adapted for particular uses (Skateboard Pavilion, 1989; New Space for Showing Videos, 1995; Girls’ Make-Up Room, 1998-2000) but all essentially running through minor variations on the same scheme. Architectural historian Beatriz Colomina suggests seeing this “global army” of pavilions as “a single artwork, a single experiment,” but the experiment has long since petered out. If Graham’s earlier work was characterized by a nervous energy that impelled him to leave things half developed in order to try something new, the past quarter-century of his career has been devoted to dogged repetition. The fox has turned into a hedgehog. But in neither case has he deepened and explored his ideas; he has merely recycled them. That’s probably another great source of his appeal to younger artists: his incompletely developed ideas are still available for their elaboration. And precisely because he realizes his ideas in such an offhand way (“I basically do fast sketches, fax them to my architects, we do a site visit, and then they bring one or two possibilities for glass”), he makes it all seem easy. But Graham’s is not the deceptive simplicity that opens up to ever more unexpected implications. It’s just facile thinking, and a formula for perpetuating a franchise. Still, I’ll bet that if you asked any of the three up-and-coming artists currently showing downtown at X Initiative what they think of Dan Graham, they’d tell you without giving it a moment’s thought that he’s a great artist. And yet at this moment, anyway, I think any one of them is more interesting than Graham–even the one whose work is the least developed, the youngest of them, Tris Vonna-Michell, an English artist born in 1982. At first glance, his exhibition consists mainly of a sparse array of tables with various objects on them, along with a couple of slide projectors; but at each station there’s a set of headphones, and that’s where the real action is, because Vonna-Michell isn’t primarily an installation artist; he’s someone who’s perhaps too easily taken on, unexamined, the convention that an installation can be the remains of an event–not the schema but the debris it catches hold of. But Vonna-Michell is really a performer–or, to be more specific, a talker. Put one of the headphones on and you’ll find yourself in the midst of a not-quite-graspable narrative monologue. Part of Vonna-Michell’s shtick is that his talks are supposed to have a predetermined duration–one that’s always too short for the amount of material he has to convey. It’s not clear what ratio of memorization to improvisation is involved, but the incredible rush of his seemingly free-associative verbiage is meant to sound almost out of control; there’s something very seductive about the urgency with which he spits out his semicomprehensible, stuttering tales of, say, trying to explore the history of Berlin by way of its streets, subways and train stations. Yet I can’t help but feel there’s something too evasive here, for all the admirable formal reflexivity and multilayeredness of the artist’s self-refractive tale-telling; a tale told very slowly might be all the more enigmatic than one that runs away from you as it runs away with its teller. Luke Fowler, born in Scotland in 1978, is one of a number of younger artists these days who are playing–I might even say toying–with the conventions of documentary film. Fowler has even set up a sort of movie theater in the middle of his space, with seats and everything, pretending to eschew the conventions of video installation even as he knows full well that building a cinema in the middle of an art gallery is just another way of making an installation. One film is a biography of an eccentric musician called Xentos Bentos. I took it as a parody documentary about an invented subject–not a hoax, because it was all too outrageous to be taken for real, but a pastiche. But second thoughts and an Internet search convince me that there really was a Xentos Bentos–although not much information is available about him and almost every occurrence of his name seems to be preceded by the word “mysterious.” I still think the film is a parody–but the joke is all in the style; and the facts, after all, are probably straight-on. Stewart Home has called Fowler’s style “a pop appropriation of underground film techniques,” but the point seems to be that a ragged, vérité style in which no strong authorial viewpoint seems to be imposed on the material is just as artificial as any other. Pilgrimage From Scattered Points (2006) concerns the British avant-garde composer Cornelius Cardew, who started out as a follower of Karlheinz Stockhausen and ended as a Maoist proclaiming “Stockhausen serves imperialism.” Made up mostly of period footage, the film has something of the ramshackle feeling of Cardew’s efforts to make music democratically with amateur musicians–yet from a disillusioned perspective that recognizes both the inspirational and the absurd aspects of the composer’s failed quest. The delicately maintained neutrality is almost dreamlike. What Fowler does for documentary, the Berlin-based Israeli artist Keren Cytter does for nearly every film genre imaginable–tear-jerker, melodrama, sitcom, thriller, Bergmanesque spiritual self-examination, you name it. She takes them to pieces and examines the fragments with loving yet ironic fascination. Like Fowler, she treats the makeshift as a stylistic apparatus: “When I shake the camera I suppose you could say I’m trying to impress by consciously employing a ‘homemade aesthetic,'” she once told an interviewer. Her medium is video, but she calls her works films; it’s hard to think of anyone who’s manifested quite as voracious an appetite for cinematic sensation since Graham’s old favorite, the young Jean-Luc Godard. At X Initiative she has installed her work–in contrast to the seeming purity of Fowler’s approach–as an “immersive experience,” meaning that the films are placed and sequenced in such a way as to set the viewer into motion. As one film ends, you can hear but not see another one start up somewhere else in the space; by the time you’ve reached it, you’ve already missed the beginning–you’re in media res. It works because the structure of the exhibition echoes that of the individual films, which also seem without clear beginning or end and repeatedly take the viewer by surprise with abrupt shifts that are no more predictable than the changes in direction of the path through a labyrinth in which one is lost–trapped as her characters are trapped in the stereotypical roles they’ve taken on. X Initiative, by the way, is the building that used to be the Dia Foundation’s exhibition space on West Twenty-second Street. It was home to some of the shows that linger most poignantly in my memory from the period between the late ’80s and the beginning of the present decade, among them impeccable, long-running presentations of artists like Robert Ryman (1988-89), Lawrence Weiner (1991-92), Jessica Stockholder (1995-96) and Fred Sandback (1996-98). Since 2004 the building has been empty; now a group spearheaded by gallerist Elizabeth Dee has the use of it for a year. What they’re making of it has not gone without criticism; in New York magazine, Jerry Saltz called its first round of shows, which I missed, “a bit dry (and too close to Dee’s exhibition program: She has shown two of the three artists).” Of this second round, it has been widely noted that all three artists were also just included in the New Museum’s “The Generational: Younger Than Jesus.” Since X Initiative director Cecilia Alemani is the girlfriend of New Museum curator Massimiliano Gioni, it’s hard not to feel that an organization that idealistically calls itself “an initiative of the global art community, with a goal to inspire and challenge us to think about new possibilities for experiencing and producing contemporary art” has an exceedingly narrow, if not parochial, sense of the global. But the fact remains that X Initiative has done a great service by enabling these three artists to present their work on a scale far beyond what a commercial gallery could house or a museum could justify. For the year, at least, New York City has a Kunsthalle big enough to suit it.